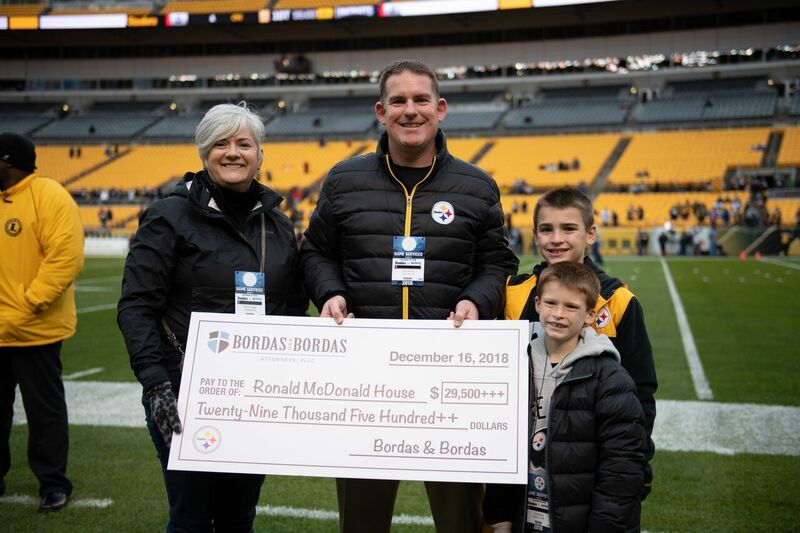 PITTSBURGH, Pa. – The law firm of Bordas & Bordas has donated a total of $33,000 to the Ronald McDonald House Charities of Pittsburgh in conjunction with the firm’s Pittsburgh Steelers partnership for the 2018-2019 season. Eleanor Reigel, Executive Director at Ronald McDonald House Charities of Pittsburgh, at left, accepts the check from Jamie Bordas, Jay Bordas and Luke Bordas. Submitted photo. A check presentation was held prior to the Steelers’ regular season home game against the New England Patriots on Dec. 16, 2018. The firm, which places a heavy importance on philanthropy, donated $500 to the Ronald McDonald House for every sack made by the Steelers defense this year, including the pre-season. The Steelers ended the season with a total of 66 sacks. “At Bordas & Bordas, we feel it is important to give back to the organizations in our community. For the last four years, we have been very pleased to provide philanthropic support to the Ronald McDonald House through the partnership with the Pittsburgh Steelers,” said Managing Partner Jamie Bordas. The Ronald McDonald House is a charity designed to help families with children being treated in a medical center. The organization has local chapters in more than 64 countries and regions. It often provides housing and meals at little or no cost so families can focus on care and togetherness rather than worry about the rising costs of hotels and travel. “The 52 regular season sacks from 2018-2019 tied for the NFL lead with Kansas City,” Bordas said. “Not only is this a great accomplishment for the Steelers, but it is also great for the many families who benefit from this partnership,” Bordas said. Bordas & Bordas is a plaintiff’s litigation law firm of 19 attorneys with offices in Pittsburgh, Wheeling, W. Va, Moundsville, W.Va. and St. Clairsville, Ohio. The firm’s attorneys practice throughout the region in diverse areas of law and are licensed in Pennsylvania, West Virginia, Ohio, Texas and New Jersey.